First model of the Trimpro Original. Patents were secured in Canada, United States, Europe and Australia. Andre, Pierre’s brother, joined the company to continue to expand its scope of sales. He was living in Barcelona at the time so travelled throughout the country as well as other parts of Europe and quickly picked up on the specific requirements of the region. To respond to the demands from European growers, a plant trimmer based on the same principal as the Trimpro, but smaller, was introduced to the market. It was called the Trimbox. Soon after, enhancements were made to each machine to meet the particular demands of some customers. The Workstations for both the Trimpro and Trimbox were introduced resulting in four machines being available to meet most trimming styles, but the continuous effort to improve did not stop. The boys realized there was a requirement for a more productive and safer piece of equipment so they started the development of the second generation of trimmers. The focus was to design a machine which required less manipulation by the operator. A circular hermetic structure was added on top of the grate creating a whirlwind effect. 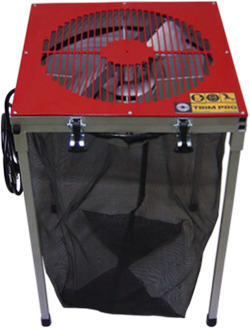 Adding a stronger motor and a second set of the famous Trimpro blades created enough wind for the plants to move on the surface of the grate while the leaves were pulled through the slots and trimmed, the same concept as the original Trimpro. In 2006 this novel machine called the Automatik was introduced with great market acceptance. It wasn’t long before requests to produce a higher volume Automatik machine were being received from growers. This led to the development and production of the largest Trimpro presently on the market, the XL. Again, a more powerful motor and extra set of blades were required as well as a redesign of the grate. The results were spectacular with immediate acceptance in the North American and Australian markets, Europe not being far behind. Innovation is at the cornerstone of Trimpros success. In 2009 the Gasoline model was added to the line. Made for growers who prefer to work outdoors, the machine deploys a 1.3 hp Honda gas motor with the Automatik technology. In their continuing efforts to meet the requests of their customers, the Trimpro team introduced a new machine in 2010, the Rotor. The design deviates from the traditional Trimpro technology but encompasses the same pride and engineering. The plants are gently rotated over the grate by leather fingers and trimmed by the razor sharp Trimpro blade system. This machine compliments the Automatik by using a different technique to move the flowers on top of the grate. 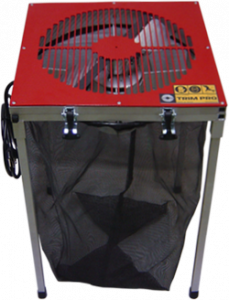 The success of the Trimpro product line is based on the fact that they are simple, efficient and durable machines. When introduced they responded to a real market need as apart from scissors there were really no other products available to growers. By constantly improving upon the original model through innovation, they succeeded in building an excellent reputation, one which is the envy of their competitors. This is backed up by their excellent after sales service and warranty. Trimpro has grown from a concept to an established company employing more than 20 people in their shop and offices. Proudly made in Canada, the Trimpro line of trimmers are simply the best on the market.